… and What are You Getting This Christmas ? – Click and Unwrap to See ! SAV would like to send early wishes to everyone for a very cruelty free Christmas, and a Very Happy New Year in 2009. Thank You for all your support with all the campaigns – we hope to have your continued support next year. KEEP ON BEING A VOICE FOR THE VOICELESS ! ! if there was a trophy to be handed out for those that do wonderful work but quietly and where it is needed the most I would give it to my two friends Guzide and Ayse. They work together in the areas of Istanbul where N & R is required the most but very rarely touched. My vote for the two most caring ladies in Istanbul goes to Guzide and Ayse. Thank you so much you do wonderful work, I should know because I have followed you for a few years now. Istanbul Archeology Museum is in the center of old city, a favorite place for tourists. 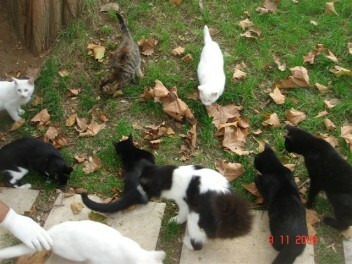 This peaceful place has a large garden with full of trees that has been a home for several large cat groups. 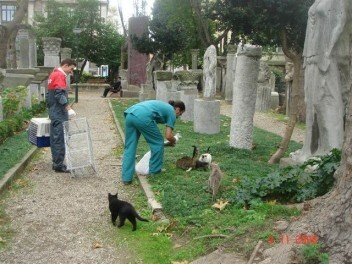 The number of cats have been increasing significantly for two reasons : (i) No sterilization took place beforehand (ii) Cats are being dumped into the garden from other areas. The pictures give an idea from the place and cat groups. 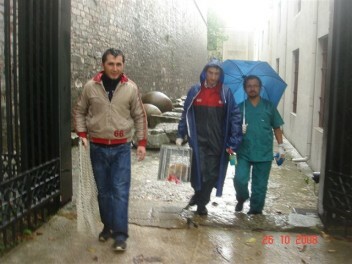 Initially a two-day sterilization activity was realised. The third step was done 2 weeks after. The Museum team are very cooperative with us, they allocated a place for the equipment, operation and post-operation. A team of a vet, vet. 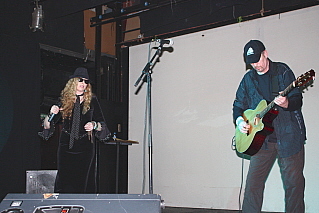 assistant and a catcher worked together during n&r. 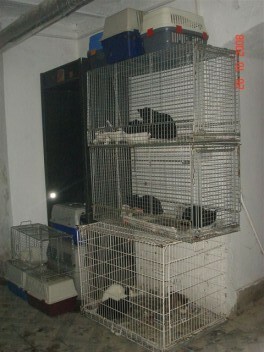 Total number of cats sterilized : 42 (17 male, 25 female). All of them are vaccinated against rabies, besides inner and outer anti-parasite treatments applied. Only vaccinated : 8 ( 5 of them were young enough for an operation + 3 were already sterile). Actiezwerfhonden that provided the cat trap. The vet who is in green giving injection for anaesthesia. This vet has been very experienced in n&r. He can make the operations through a very small cut with inner stitches, so that the recovery period is the shortest possible with the minimum risks. Please see below how small cut he makes the operations from. 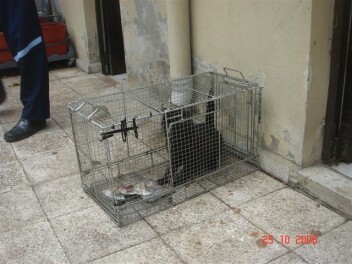 The traps are very useful when catching (cat trap) and keeping the cats before/after op (dog traps). The traps were provided by Actiezwerfhonden (Holland). There was heavy shower in the morning, but the team continued the activity. 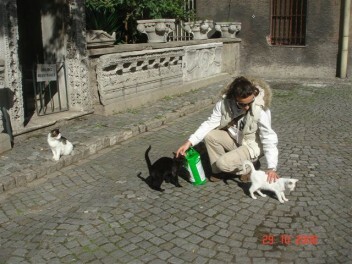 A visit was made to the place 3 days after to check the area/cats. The non-sterile ones and the ones require medical treatment were noted for the 3rd step. Ayse Doganci is in the picture. A sign is required to separate the sterilised one from the others (male ones can be identified but the females!). 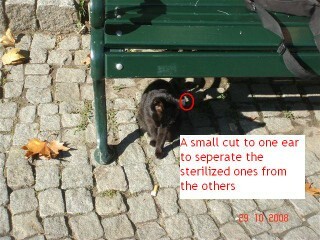 In every sterilisation activity we catch one or two that had been sterilized before but have no sign of the operation. As seen, the small cut to one ear given during the operation enables easy separation. 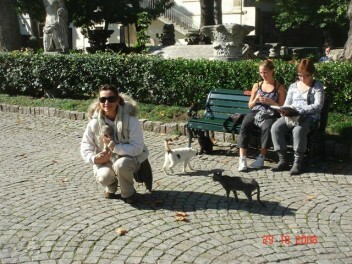 The tourists and cats are very happy to be together. During catching, we received so many questions and curious looks. 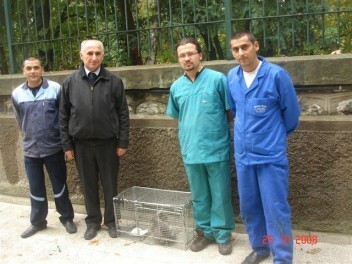 It was pleasure to tell them that “this catching was for sterilisation and vaccination only !”. Those explanations together with the team’s careful and caring attitude gave them a good relief. THE THIRD STEP, 9th Nov. The third step was realised on the 9th Nov. It was good to see the sterilized ones around. Upper respiratory infection (viral) are very common among the cats. We observed that the rate was not below than 60%. As the winter is close, we will not do the operations till spring. In the mean time, a vitamin and anti-biotic treatment is planned. A day-long activity can work well. There are still non-sterile ones that are very difficult to catch. Besides, there are many young ones around. If those are done in next spring, then the cat populations will be kept under control. Canada: After the Seal Pups, Now The Government Approves Mass Whale Killing ! now the horror has turned into a blood bath of up to 500 narwhales! single ivory tusk, worth $1500 a piece. save the lives of these whales. thoughts and sentiments on this grave matter. normal pace due to human activities. “healthy” to justify a mass slaughter. course to take in response to this outrageous killing spree. are an integral part of. When we save whales, we save ourselves. Because when we save whales, we save ourselves. message to see the work of SOS and also Maria and Paul. (SAV). 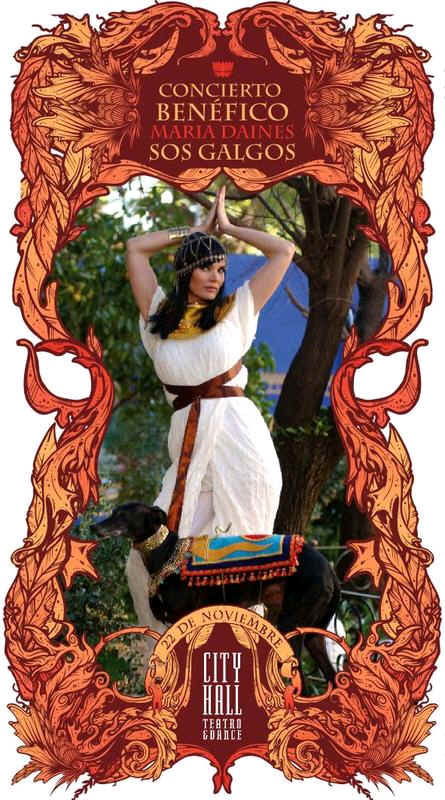 there’s some pics on the SOS Galgos website. Have a great weekend & keep on rockin!!! 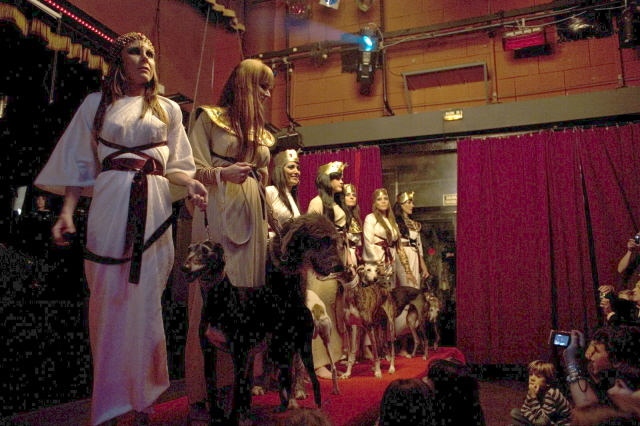 them galgos, it was so glamorous and unforgettable. Wonder is looking at the picture of her wonderful self! badly need help when they are cast out or neglected. You are in our hearts always. 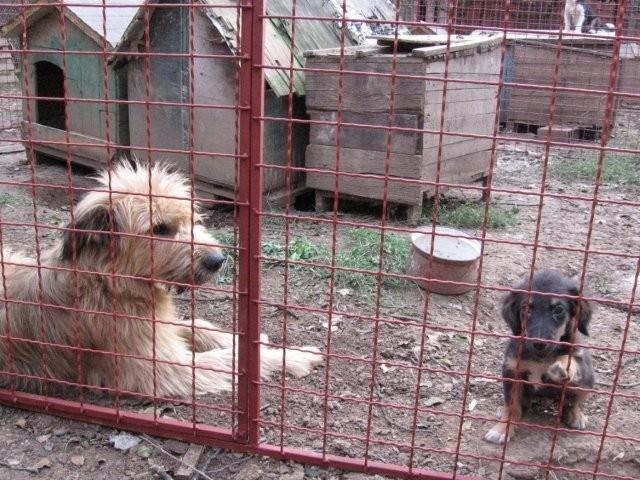 Appeal for Overseas Homes for Serbian Shelter Dogs – Please Pass On. 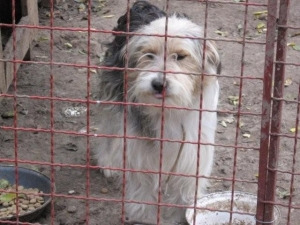 to Austria to their new homes that Animal Care Austria is finding. and certificate and 50 Euros for transport. Wednesday we can send dogs if we had money to pay the necessary expenses. 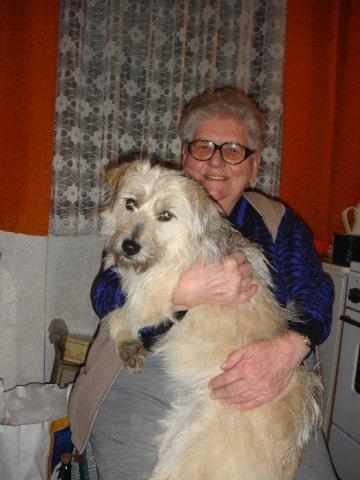 Please give anything you possibly can to help us send dogs to loving homes in Austria. 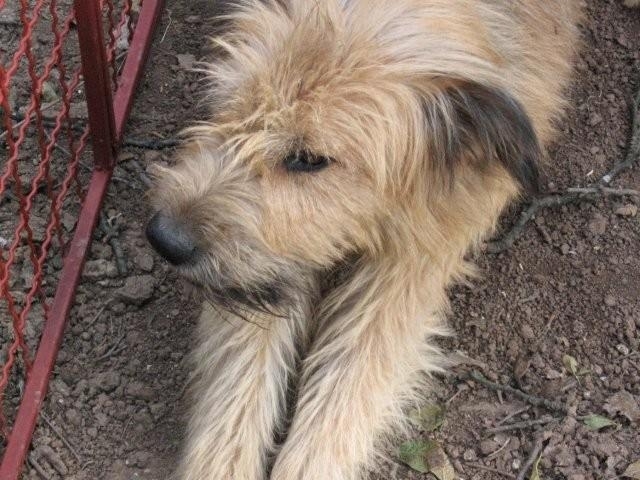 This dog is named ’Zeljko’ and there is interest in him being rehomed already. 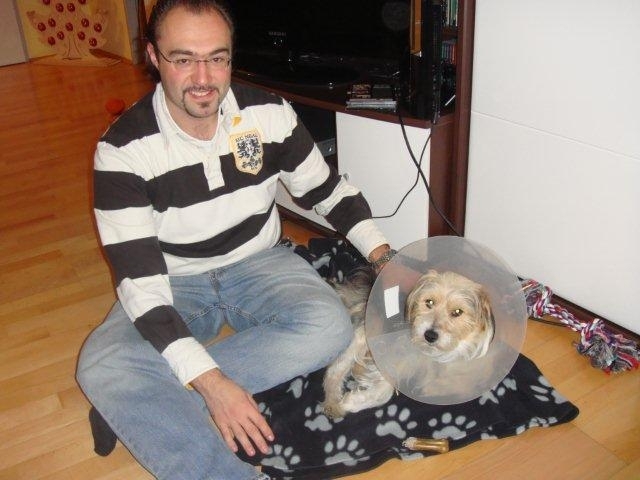 Jelena needs 70 Euros for blood tests regarding rabies so that he can cross the border without problems and 25 Euros to take him to another town, from where a van will pick him up to take him to Austria. ACA in Austria are contributing the 50 Euros needed for transport. Please can you give a donation and help raise the money for the essential blood tests. This dog is named ’Bane’ and is going to Austria next Wednesday. Do you remember Sirkan was shown waiting for a new home on our site recently ? has now been given a new home. Now Jelena has sent 15 dogs and 3 kittens so far to Austria; and with your help and support, we can find loving homes for many more. and then please GIVE A DONATION !! 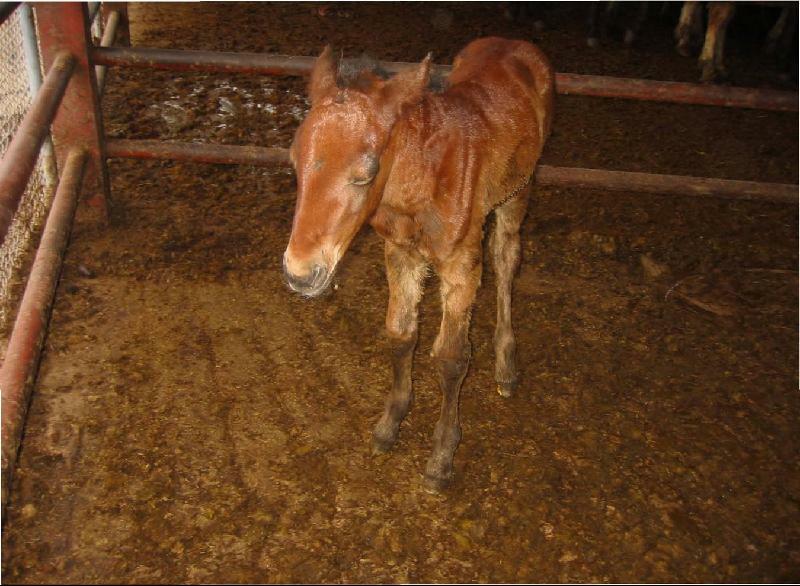 part of 2005 at the Beltex horse slaughter plant in Texas. 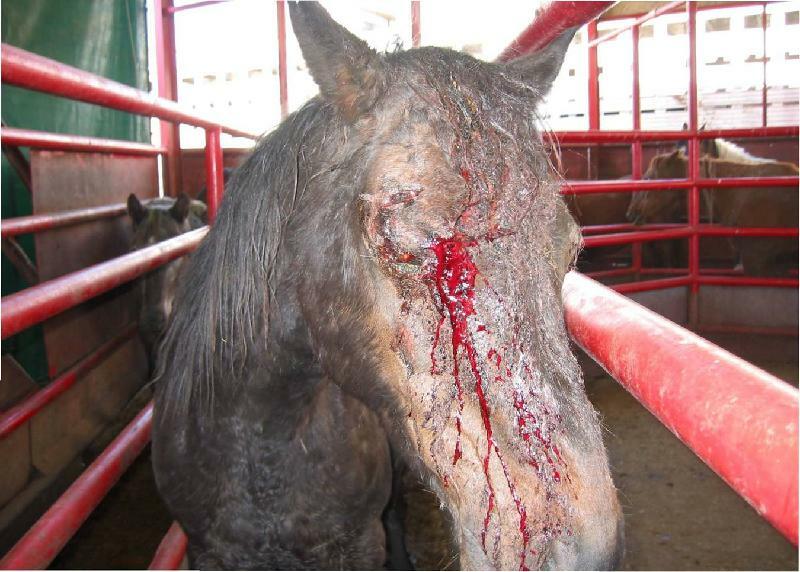 corresponding directly to horse slaughter. better, so much more humane than what happens in Mexico. Further information, video and pictures…. and similar legislation was passed in Illinois. 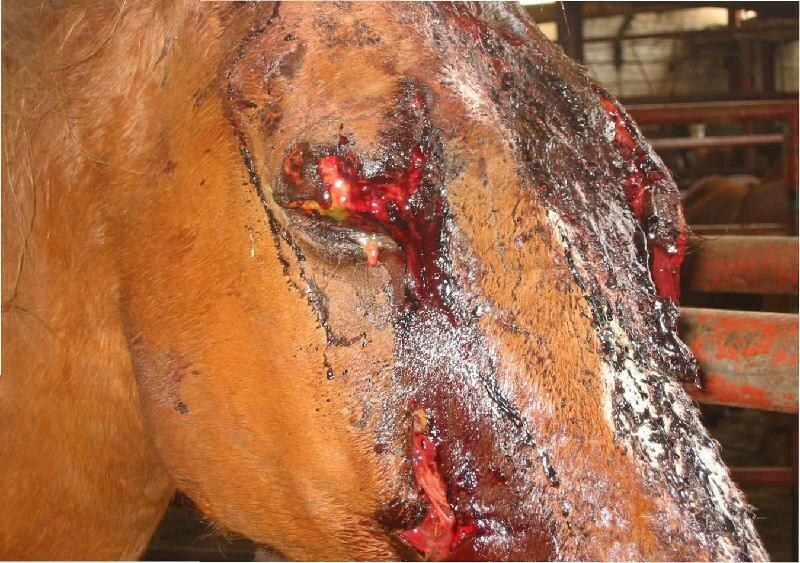 horses still being slaughtered for human consumption abroad. can be sent to markets in Belgium, France, Italy and Japan. organizations will try again elsewhere in the United States. animals to slaughter plant middlemen known as “killer buyers”. as possible from livestock auctions around the country to the slaughterhouses that have now relocated to Mexico and Canada. 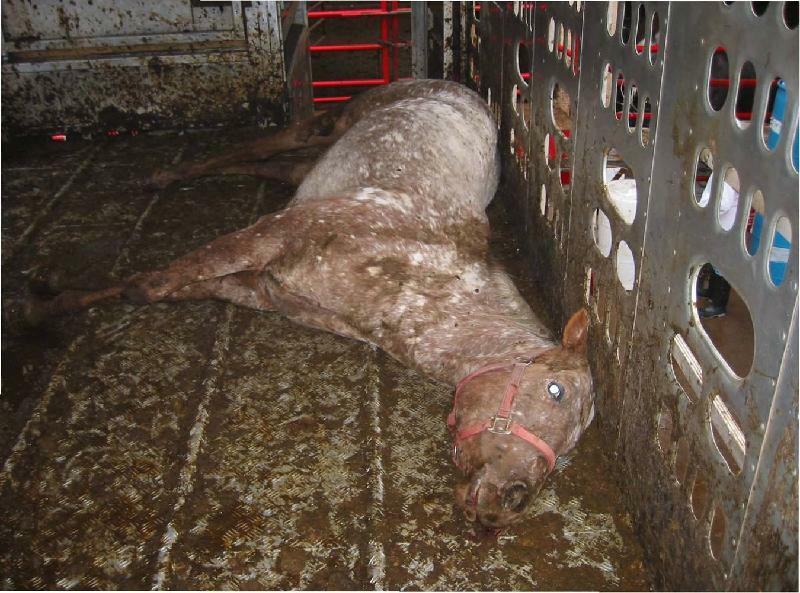 export of slaughter horses to Canada and Mexico. TRANSPORT VIOLATIONS AT BELTEX WARNING – GRAPHIC CONTENT! 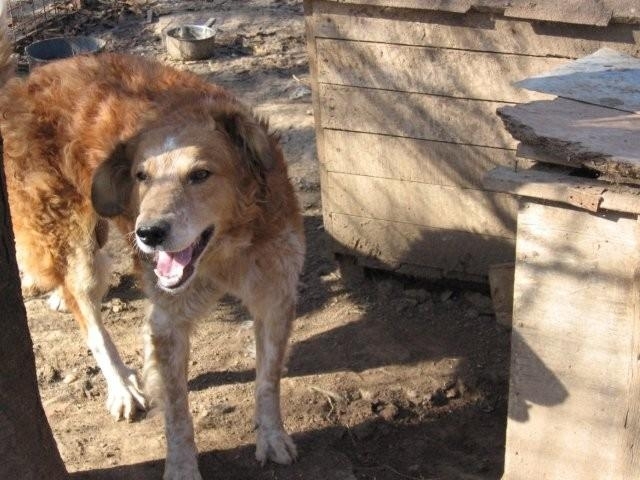 Please Sign as many of the following petitions as you can – Thank You.